Thomas is our Lead Exercise Physiologist based in the Construct Health Mackay clinic and joined the team as an experienced clinician in 2018. Thomas graduated university top of class at the renowned German Sport University in Cologne in 2010. 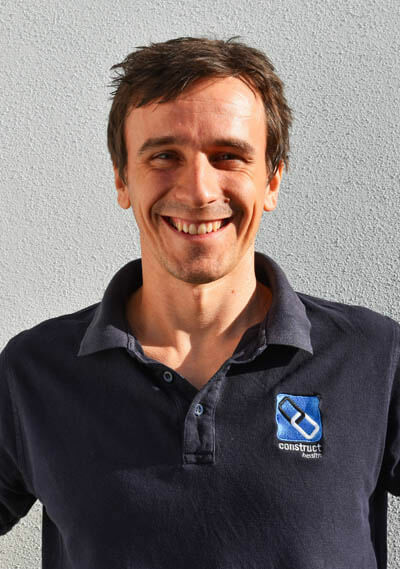 He holds accreditations as an Exercise Physiologist and Exercise Scientist and has worked with anything ranging from performance driven national level athletes up to patients with a long pain and injury history. His special interest lies within treating running and sports injuries and specific strength and conditioning work, which aids a faster and more successful return to sport as much as a general increase in performance. As an Exercise Physiologist he also has experience in assisting with treatments for conditions such as Osteoporosis, Osteoarthritis, Rheumatoid Arthritis, Parkinson’s Disease, Cancer and Diabetes through exercise, enabling patients to achieve a hugely improved quality of life. Furthermore, he has experience in prescribing pre-natal and post-partum exercise programs to assist with musculoskeletal pain management throughout pregnancy and with a safe return to sport and full activities after pregnancy. He is a keen athlete himself, having completed an Ironman 70.3 triathlon, a Spartan Beast Obstacle Race and multiple half marathons amongst many others. On the weekends you will find him walking along the beaches or playing in the park with his wife and two young kids.